While I was getting ready for Father's Day a couple of weeks ago, I realized something. With the plethora of "mom products" available for purchase, there isn't much out there for dads. Now I get that moms are probably a bit easier to market to. I mean, I always find it much easier to buy for a woman than for a man. But dads still deserve some nifty products that cater to their parenting needs as well. So, when I was contacted about the Daddy Caddy, I jumped at the opportunity to feature the product. Before my son was born, I remember gravitating towards the bright, colorful diaper bags decorated with flowers, frills, bright pink designs, etc. I instead purchased a black diaper bag since I didn't want my husband to be forced to carry a woman's bag when out with our son. Through the years I eventually gave in and bought diaper bags with a more feminine design. And my husband has carried them when out with our son without me. I know he doesn't mind much. After all, its just a bag. But it would be nice to have something that's a bit more practical and masculine for him. Cue the Daddy Caddy. This innovative little pouch holds the necessities and can be carried a variety of ways. It can be clipped on a belt loop, connected to a stroller handle, even attached to the front of a bicycle. The design is clean, functional, and light. 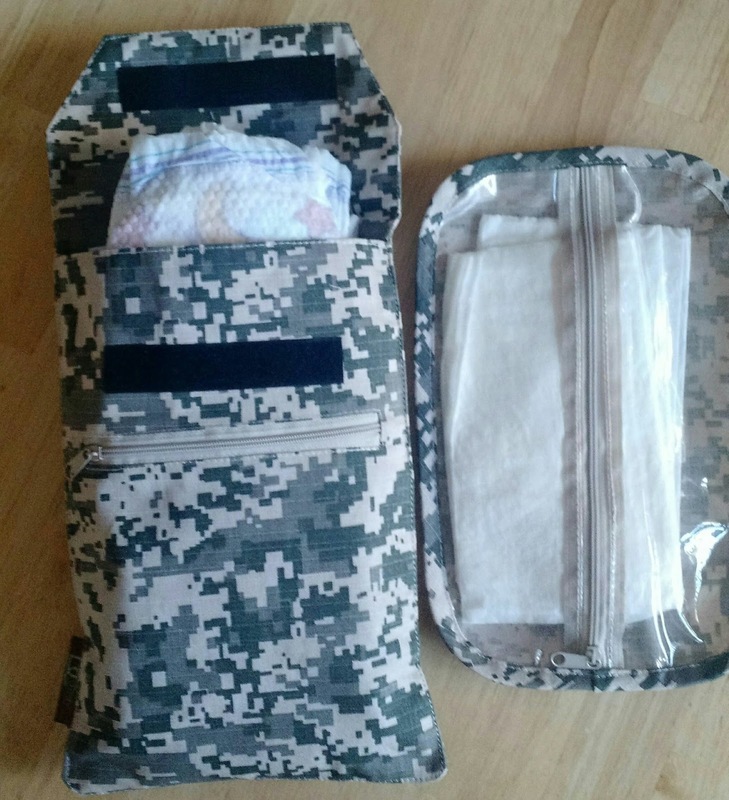 It easily fits a few diapers (my son wears size 6 and it fits three with room) along with wipes in the matching wipe pouch. 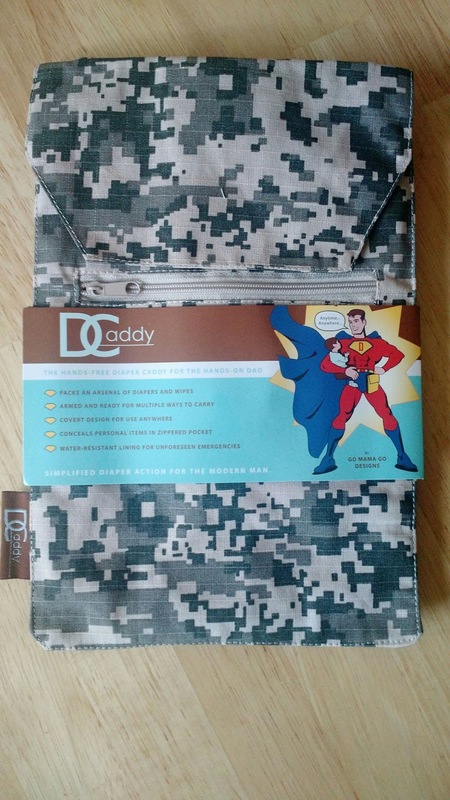 There is also a front zippered "Daddy pocket" that can hold dad's belongings - keys, phone, etc. 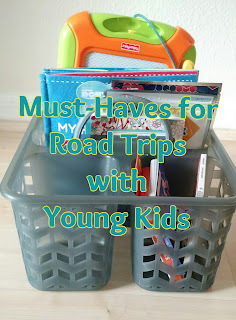 It can also fit a juice box or a spare change of clothes for your little one. My husband loves the camo design and now keeps this small pouch in his car for quick trips with my son. Finally, a product for the dads that will get some daily use! 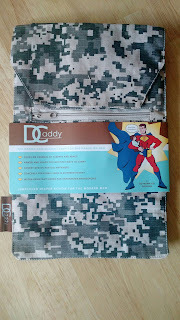 To find out more on the Daddy Caddy and view the different designs visit their website here.